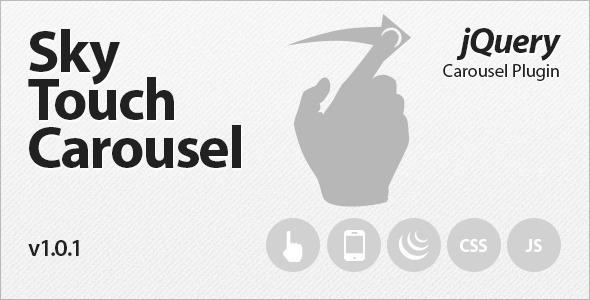 Here is a most advanced touch enabled WordPress slider plugin. This WordPress slider offers a touch swipe navigation that works smoothly on any devices. 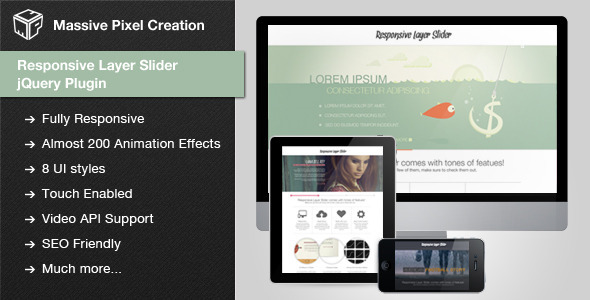 It is a free responsive WordPress slider and content slider with amazing transitions. 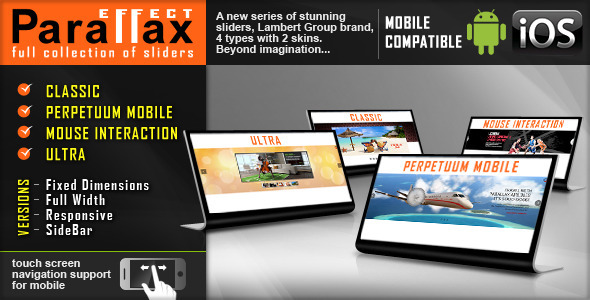 This master slider works perfect in all major devices. 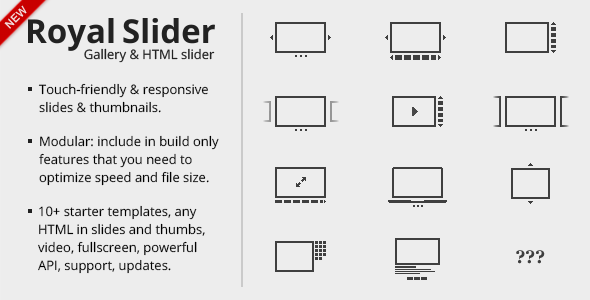 Some of the features of this touch enabled slider are fully responsive, touch swipe navigation, HTML5 valid and SEO friendly markup, drag & drop slider, Hardware accelerated CSS3 3D transforms, 8 starter samples and many more. Creating and managing the sliders on WordPress website is simple with this WordPress slider plugin. This easing slider offers a nice user experience. Some of the additional features that you can gain along with this are simple captions, thumbnails, posts feed, video slides, carousel, external images and lightbox. This plugin is the easiest way to create wonderful sliders on WordPress blog. 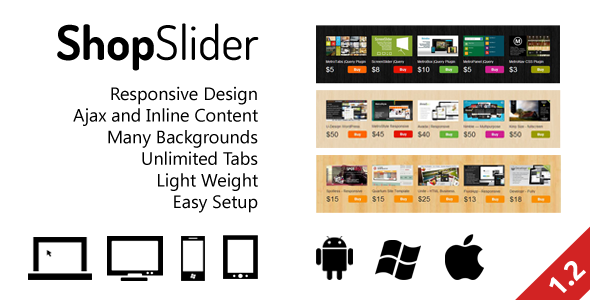 Download it free WordPress slider. 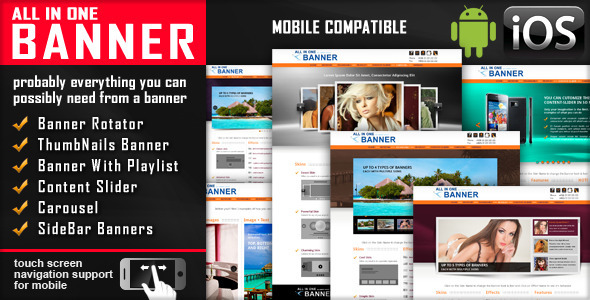 With the advanced jQuery slider, the new all-in-one banner includes 5 different banner types -Thumbnails, Carousel, Banner with Playlist, Banner Rotator and Content Slider. Its fully responsive and touch friendly navigation supports almost all the touch screen mobile devices. It consists of 3 predefined skins and 16 photo transition effects. Multiple instances can be inserted on the same web page using the same skin type or different skin. The quality and the features of this product makes this slider easy to set up & maintain. 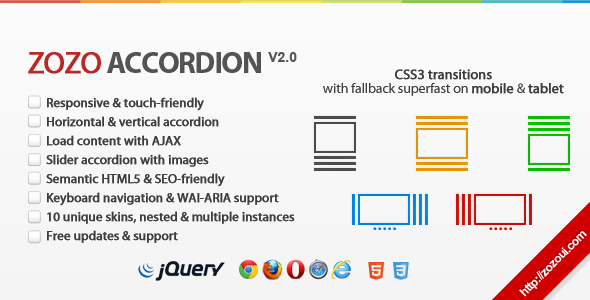 Its one among the best jQuery sliders available in the market today. 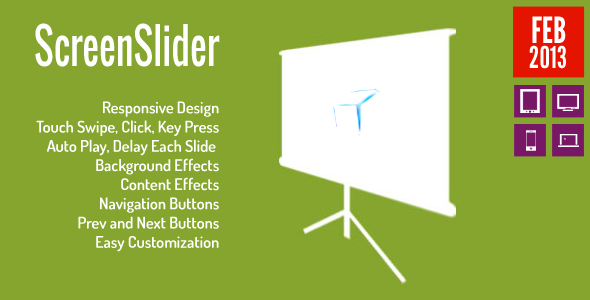 The advanced slider is created to be used in various contexts. Its fully responsive and can be used on all mobile types. Its SEO friendly. The API offered with the plugin allows it to be used on your own application by enhancing its functionality. Its key features include touch screen support, smart video, animated layers, 100+ possible transition effects, HTML/XML support, 150+ customizable support, built-in lightbox support, keyboard navigation and much more. Translucent touch enabled WordPress slider is a highly responsive & fluid layouts. Its fully touch swipe navigation feature enables it to be used on multiple devices like iPhone, iPad, tablets, Smartphone’s etc. It’s complete set of background captions can be customized by CSS as well as plugin settings. It supports more than 6 types of navigation variations and its transition speed can be adjusted as per the requirement. This jQuery slider is a highly responsive, lightweight and layered plugin that can be used in exhibiting your work (both text and image) in a professional and organized manner. The OneByOne slider plugin is mobile friendly and can be used on multiple touch screen mobile devices like iPhone, iPad, Smartphone’s, Tablets and so on. It provides an option of customizing each slide and animation element. Zoom in/out is a jQuery effect fully responsive WordPress plug-in. It Zoom and planning effect also referred to as Ken Burn Effect can be used on all major browsers. It supports 2 different types of transitions – slide transition and fade transition. It includes 4 different slider variations – full screen slider, full width slider, fixed slider and side bar slider or mini galleries. Its touch screen navigation supports all mobile types. This plugin comes with detailed documentation that makes it easy to set-up and maintain. 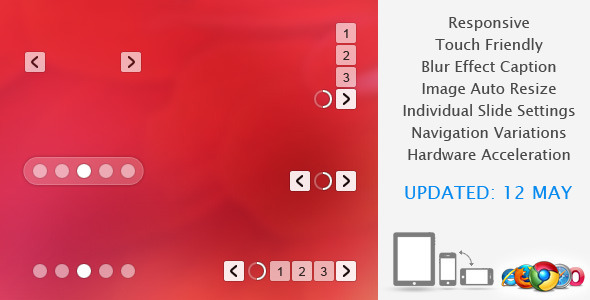 It’s a jQuery enabled content slider WordPress plug-in that comes with unlimited transitions. Its adaptive on multiple mobile devices and all old and modern major browsers. Animated layers, fully responsive, pre-slide options, 12 pre-built themes, mobile optimized, touch enabled, 40+ preset transitions, images preloader, public API, HTML content, easy installation are some of its key features that makes it a one of a kind touch enabled WordPress slider. With the Evo slider pro one can create varied slides that can be used to display their work in the best ways possible. Whether you intend to create an image gallery to exhibit your work or just want to go with banner rotator, an auto slideshow option or a presentation, this plugin can be used for various reasons and it various amazing ways. 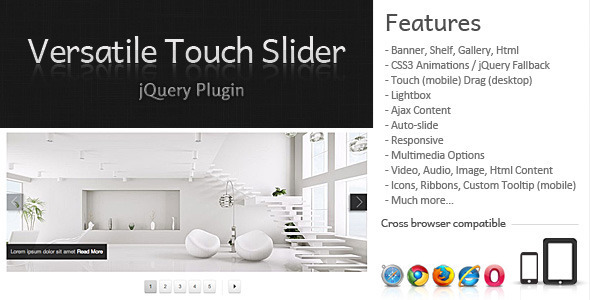 Its one among the best jQuery slider plug-in available in the market today. It easy to setup and used to customize your site as per your preferences. Zuper WordPress slider is a highly responsive slider enabled with Fluid grid layout. Its design and effects elements makes it possible to turn a simple HTML site/blog into a beautifully designed slider that is sure to attract huge traffic to your site. 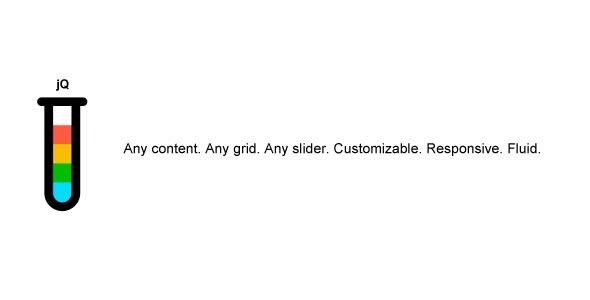 One can change the complete look of their website with the help of this fully customizable slider plugin. Its simple implementation saves loads of development time. 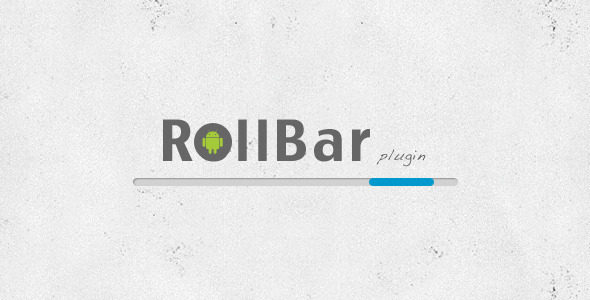 Unlike the old school standard browser scrollbar’s, the all new RollBar slider plugin was created with an intention to help its users customize their sliders in a modern way that would fit perfectly on any site. It also gives the option of creating slideshows that would have external controls. It can automatically adjust to any screen size. It touch screen navigation feature supports both iOS and android devices. 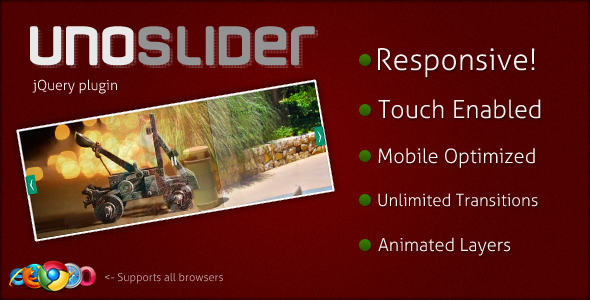 Responsive layered slider is a one of a kind, fully HTMl and jQuery driven WordPress plug-in. Its adaptive on multiple devices – desktop/laptop, tablets, iPads, iPhones and other Smartphone Devices. However its touch enabled navigation works perfectly on all touch screen devices whereas on the other non-touch devices the mouse can be used to drag and drop the required elements. Its responsive layout looks great on all resolutions. Each layer can be fully customized and animated in 200+ ways. Versatile touch slider, as the name suggests is a one-of-a-kind jQuery powered plugin that provides various options to customize your business site as per your business requirements. With the help of this plugin a simple and plain HTML site can be created into a crowd pulling beautifully designed site/blog. 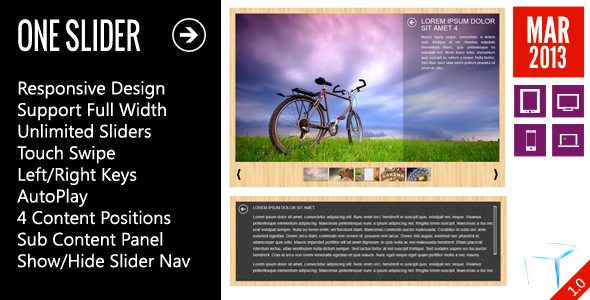 Its lightbox features makes it possible to show any form of multimedia content like audio, video, HTML content and images. This jQuery powered responsive WordPress plug-in is ideal for online shops, stores, commercial sites and so on. The best part of this plugin is that its adaptive on any screen type and size. It images are displayed perfectly on any device. It supports Ajax load and tabs. It supports multiple sliders on the same page. Lightweight, Hover to pause, easy setup, variety of slides & effects etc are some of its key features. With ScreenSlider plugin you have the option of transforming your simple HTML or CSS site into a stylish, elegant and professionally designed site/blog. Its a fully responsive plugin that can be customized as per your business requirements. 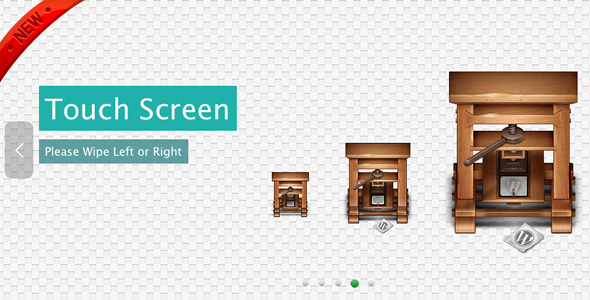 Its a full screen slider that fits perfectly on any screen size or type. Its impressive features can be used to display the content on your site in any multimedia form. You need to use it to believe it. 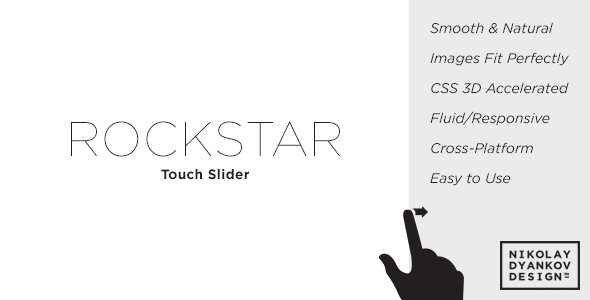 Rockstar touch slider is a highly responsive WordPress plug-in that can be for creating simple, clean and minimalistic WordPress slider. It fluid grid layout makes it possible to display any form of content perfectly on any screen size or type. Its very easy to setup, use and maintain. Its features makes it possible to move the animations in a natural way. Its packed with loads of amazing features that makes it worth trying. Geome slideshow is a highly responsive WordPress slider that supports multiple devices and is also on all JS enabled browsers. You will be awestuck with its cool features that includes, touch navigation, touch freeze, touch swipe, Detailed API documentation, cross platform friendly, SEO friendly, multiple slideshows on a single age, auto-play feature (optional), Responsive and adaptive layout engine, arrow key navigation, hover to pause feature (optional) etc. Canvas slider is a fully responsive, touch enabled jQuery banner rotator plugin that was created using HMTL5 transitions. All thanks to its bullets and thumbnails control that helps in easy and smooth navigation of the slideshow or sliders. It is compatible on all modern and major browsers like IE, Crome, Firefox, Safari and Opera. Its also adaptive on iOS enabled devices. Its very much compatible on old browsers and fade transitions.